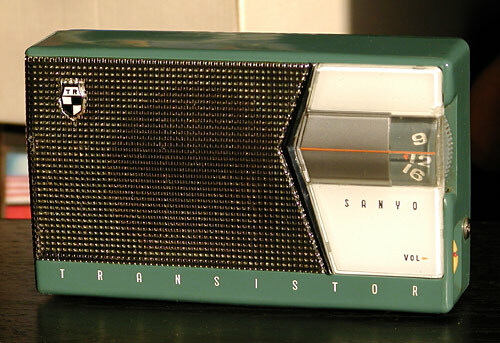 The 6-transistor Sanyo 6C-10 was released in April 1958 at the price of ¥10,900. I suppose this one is in the colour Sanyo called "sweet-green". It's a small horizontal coat-pocket radio with a clean line and enough style to escape its overall orthodox appearance. The speaker grill is chromed and the escutcheon to the right is reverse painted in off-white, black, gold, silver and orange. The Sanyo "TR" logo badge, chromed flash between speaker and escutcheon, mustard yellow volume switch knob and grey tuning dial knob add highlights.